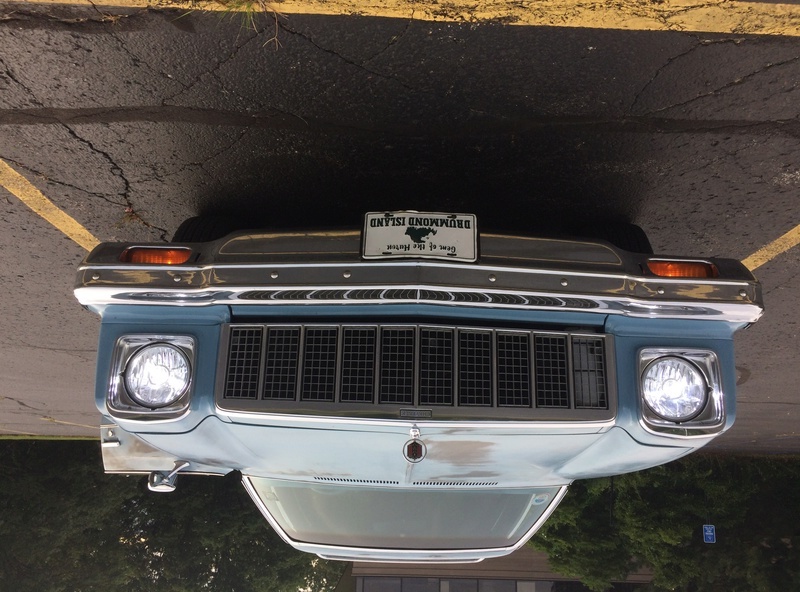 I also had my hood hinges rebuild by Wilson Antique Auto (hoodhingerepair.com) and they look great. I was finally able to give them a test and they are SOLID! They work smoothly, hold the hood up at any angle and have no side-to-side play. No more stick holding up the hood at car shows! About how much did it cost for them to re-do your hinges? Looks great! best of all it'll be reliable now! Hopefully get another 150,000 miles out of it! Be a good feeling getting it back out on the road again. The speedo gear is a typical place for the th350 to leak from. Same with the input shaft seal and the output shaft seal. They'll figure it out! alowerlevel wrote: About how much did it cost for them to re-do your hinges? $150. Came back primered, wrapped in bubble wrap and packing peanuts. Plus they included some swag--notepad, pen and bottle opener iwth their business info on it. One can pay more if they choose a different finishing option but I wanted to paint them myself. What all did Wilson do to refinish them? Kyle--they sandblasted the hinges, re-drilled the rivet holes and installed new rivets, greased up the moving parts and coated them with primer. They are so nice now that I like to open and close the hood just to watch them work. I've had my hot rod wagon home for about three weeks now and since the weather warmed up a bit I've been able to drive her around the block a few times. However, I have to get the damn brakes fixed as I've got a leak on the front passenger corner AND air in the lines (stopping is exciting). I also have a ticking coming from the same side of the engine so I'm trying to get it back to the students to get those two issues fixed. And I've got an oil leak at the dipstick that wasn't there before the engine work was done. Seems like the repairs never end! The last thing that was done was fixing the transmission leak; apparently the "bullet" needed replacement or repair. No more leaks. I am not sure what I'll have done in the coming months. I have a door that needs to be aligned so it will shut correctly and I'm going to get an estimate on having repairs made to the driver's side B and C pillars: there is rust damage where they meet the door sills and there are holes that should be patched. dhw3971 wrote: I've had my hot rod wagon home for about three weeks now and since the weather warmed up a bit I've been able to drive her around the block a few times. Nice to have that type of weather again. I was able to fix all the remaining issues with the hot rod wagon: I replaced both front flexible brake lines, bled the brakes (three times ), quieted the clacking rocker arm, fixed the oil leak (turned out it was a distorted valve cover gasket) and got the door aligned! wooosh! I then took it to a local mechanic who correctly plumbed some vacuum lines and set the timing--runs smooth as glass now! I've been enjoying the local car show circuit and having a grand old time. Next, save up some money for some body repair in a year or so. dhw3971 wrote: I've been enjoying the local car show circuit and having a grand old time. Yes it is! I've got fair to middling mechanical skills so I like it when I can solve problems myself--fun and rewarding. My next big idea is to replace the carburetor with a fuel injection kit--maybe a kit by FAST or an MSD Atomic kit. If I save my extra money (and no emergencies occur) over the next year I should be looking at an installation this time in 2016. So the fuel injection plans never materialized this year but my wagon has been running really well and I spent the summer just driving it around and showing it off. At one show I won second place (out of three entries! ) in the "Diamond in the rough" category. With luck, next year will see big changes. In April of this year I lucked out and had a short story about my station wagon printed in Auto Restorer magazine. As a result, a former Chevelle wagon owner contacted me wanting to give me some of his parts stash! We connected last month and he brought me four pristine, rust-free doors (never painted, still with GM "e-coat" on them), an entire dashboard assembly (with no cracks)and a power steering pump. Next summer I may make the trip to his house to get more goodies. Speaking of next summer, my plan is to have the doors installed, new weatherstripping applied and the car painted the original color but with a satin finish. Knowing how plans go, that may change but it would benefit me to get that done because right now the new doors are IN the car and I have no space in the garage to store them! 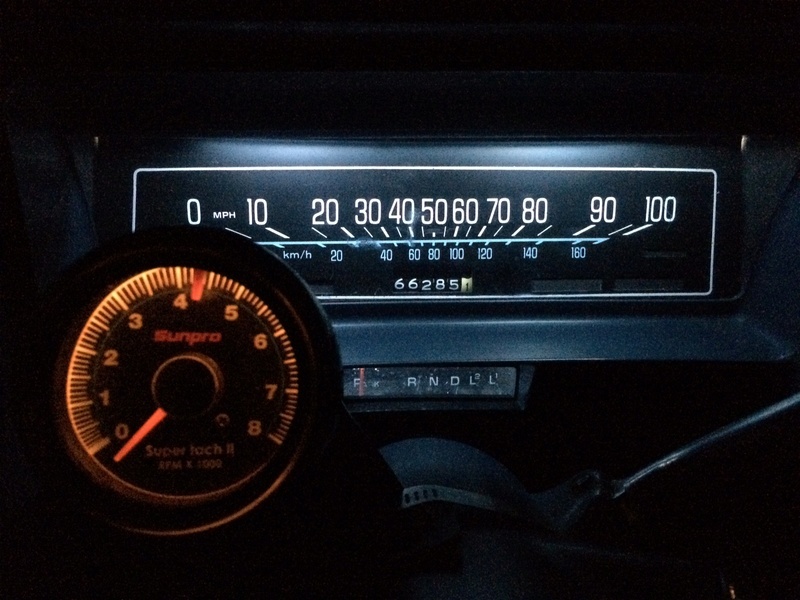 The last thing I did this year was to remove the 1975 speedometer that came with the dashboard and replace the 1974 speedo that was in the car. Turned out to be a larger PITA than I had planned but I got it done over the course of four hours. While I was in there, I replaced the weak incandescent bulbs for the speedo with LED units---made a huge difference. I also replaced all of the gauge cluster bulbs cuz I surely did not want to repeat that dumb job. Nice work, and way to go on scoring free pristine parts! 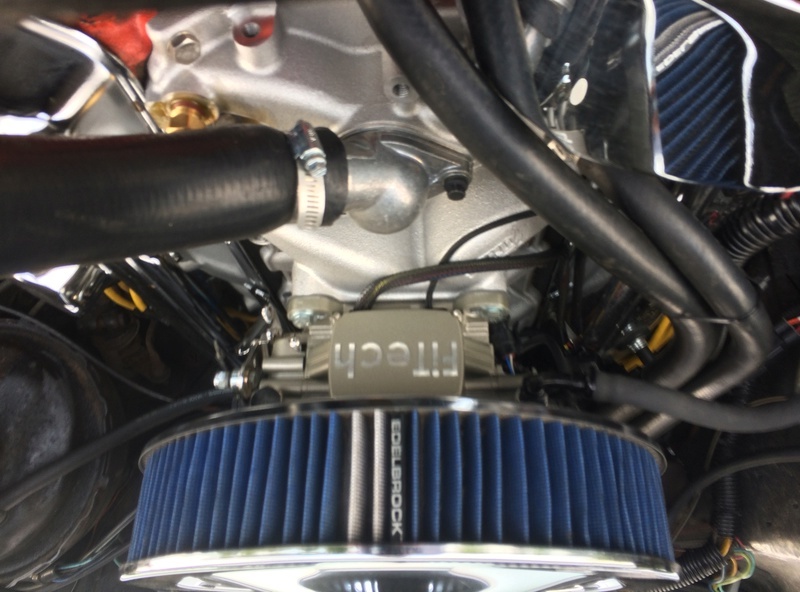 In May I (with a lot of help) installed FiTech's "Go Street EFI 400" fuel injection kit (including their "Fuel Command Center") along with a Summit Racing "Stage 1" dual-plane intake manifold. Last week, I installed Summit's "Extreme Performance coated brake rotors" & Hawk HPS brake pads and Oracle Lighting LED headlights. With the help of professionals, the FI installation took 6 hours. The fuel injection settings took a while to get dialed in (I'll give details if wanted) but now the car is running very well. The first thing I noticed was that there is no more waiting for car to warm up and drive. Turn the key, start 'er up and off you go. No racing high idle or stalling when you put it in gear. I have noticed some performance gain (considering moderate performance level of engine and 4300 pound car) when mashing the pedal but it did not turn the car into a fire-breathing beast. Throttle response is much better and fuel economy is about the same, but I have to re-calculate this weekend to confirm. 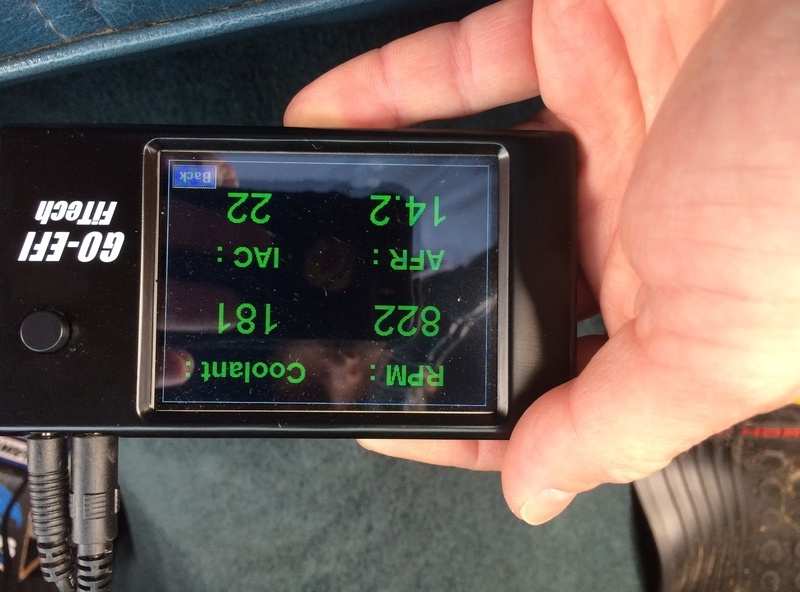 The cool part is the hand-held unit that allows you to customize many fuel delivery parameters. I tried tweaking several, made a mess of things, reverted to the baseline settings and left them there. You can also watch those parameters in real-time through the hand-held device. Fit and finish on the parts is very good and instructions that came with kit were good also. Customer support from FiTech is, um, moderate. The rotors and pads are an improvement over the 30-year old units that were on the car. I followed the break-in directions for the pads and all has been well since--pedal feel is better and the seat of my pants tells me the wagon slows down quicker. Still not as good as those in my HHR, but there is 32 years of braking system progress between the two vehicles. The headlights are a tremendous enhancement. I can see so much better at night compared to the previous halogen sealed-beam units--field and depth of vision is increased and reflective road signs really pop out. What was your total cost on the FITech install, if you don't mind my asking? The installation cost was only that of my time and two other people...fortunately one is an auto technology instructor and the other one of his star students. The cost of FiTech parts was $1190. The throttle body and fuel command center can be purchased separately or as a kit...i bought the kit for nearly the same price as you would pay to buy each. By the time I purchased the intake manifold, bolts, a new water neck and gaskets my cost was $1400. For anyone thinking of replacing their carburetor with a TBI kit, here is the review I wrote about my experience with a FiTech system. 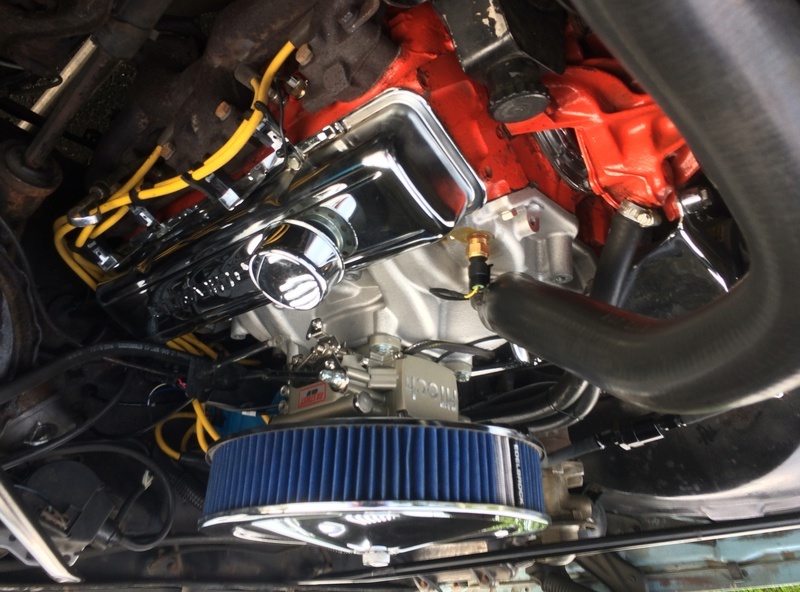 This combo was installed in May 2017 on a 1975 Chevelle station wagon with a 350 SBC making 150-200HP and has been driven about 2000 miles. First, it is a tremendous improvement over the Quadrajet that it replaced. Keep in mind that I learned the Qjet never functioned correctly and had only been running on two barrels for the several years it was in use. So, I can't compare the FiTech unit to a fully-functioning Qjet. THE GOOD: Packaging and presentation of parts is very good. Throttle body is nicely machined and looks pretty sitting on the engine. Fuel Command Center has gauges to monitor pressure of fuel flowing in and out. Hand-held controller has more adjustments than I know what to do with so I found it best to leave at stock tune for 350 V8. With the help of a licensed mechanic the installation took about 6 hours. That also included removal and replacement of intake manifold and a few other small projects done at the same time. Throttle body installation was easy (with help) but locating the Command Center in my engine bay was more difficult. I would have preferred a smaller unit for more flexibility in mounting locations and in hindsight I'd probably spring for the unit that places the fuel pump in the tank. No issues routing wiring or installing O2 sensor in exhaust pipe. 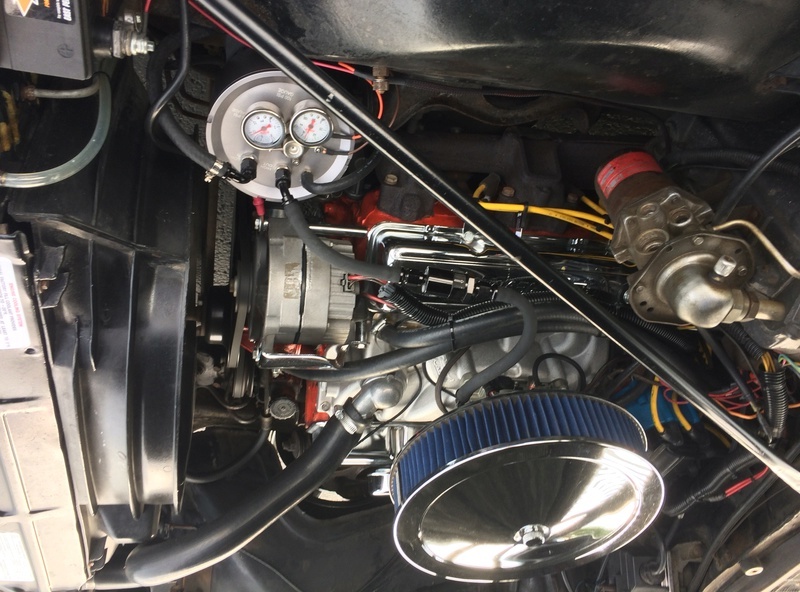 When first started I noticed two things: 1. the accellerator pedal was very stiff--I had to later buy an adapter to relocate the end of the throttle cable to another hole in the throttle body butterfly linkage. 2. a new and impressive sucking sound coming from the intake! Good things must be coming! THE BAD: After a week of use I noticed an irritating whine coming from the Fuel Command Center. When set at the PWM % as indicated in the instructions the whine was present, when I set PWM higher it immediately went away. 2-3 calls to FiTech support did not solve the problem. Two months later I gave up and returned the FCC for warranty service which took two weeks. When I re-connected the FCC the whine was gone but fuel was pouring out of the vent line. It took 2-3 more calls to FiTech support to talk to a tech who knew what the problem was. I decreased the FCC float height as directed and that solved the problem. No whine and the system worked well for two months until winter came. THE UGLY: 1. Better tech support from manufacturer is needed. I would have saved time and money if I was first instructed to adjust FCC float height. Instructions were not completely clear on float adjustments. 2. to adjust float height you have to remove the 100PSI gauge, adjust float screw, re-attach gauge and test. In my situation, the best result of the carb-to-FI swap has undoubtedly been the ease of starting the car when cold. Gone are the three start/stall/retart cycles and 10 minutes on high RPM before the choke opens up. Temperatures in low 30s resulted in no stalling or hesitation and the cool thing was watching the system self-adjust using the in-car controller. After driving for a summer I can confirm that I didn't get more horsepower or a noticeable increase in fuel economy (it went down a bit on the highway to 16-18MPG). Ease of starting and increased response to accel pedal have been the real benefits. While I was at it I had the mechanics install a new starter, power steering pump, vacuum brake booster and braided steel front brake lines. After that was complete I took it to my favorite underbody expert where the boomy and loud FloPro mufflers were replaced with Dynomax Super Turbo units. In August I removed the FiTech Fuel Command Center and installed FiTech's electric exterior fuel pump kit. Or, more accurately, I stood around and helped while my expert mechanic friend did the work. In hindsight, I wish I'd taken photos as there were some cool mods that were done to make the system work.